High spatio‐temporal resolution of river planform dynamics from Landsat: the RivMAP toolbox and results from the Ucayali River. This figure shows 31 years of Ucayali River centerlines obtained from Landsat imagery. Image credit: Schwenk et al. Our research was motivated by a common problem in studies of river migration: a lack of adequate snapshots through time to characterize river dynamics. In light of this, we embarked on this project with two broad research questions: 1) can Landsat imagery accurately resolve river dynamics at annual timescales over large spatial domains? and 2) what insights do high-temporal frequency snapshots provide that would otherwise be unavailable? Our test-case of the Ucayali River demonstrated that indeed, mapping river planform dynamics at an unprecedented spatial scale and annual frequency is possible by mining the Landsat archives, paving the way for continental- or global-scale analysis. Combined with only limited field data, our study allowed us to parse simultaneous climate, sediment, and cutoff controls on river migration and width. We were also able to document the first evidence linking meander cutoffs to nonlocal morphodynamic changes and provide evidence of avalanching dynamics in meandering rivers. 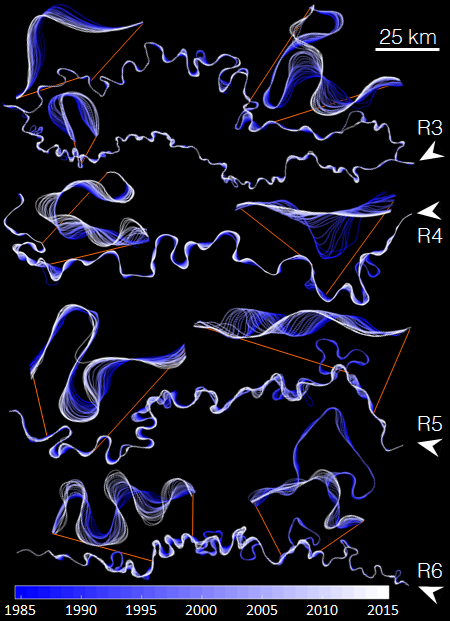 Our findings cast new light on the processes controlling river migration and suggest that current models of long-time meander migration may not include key mechanisms. We were able to quantify the degree of accelerated migration and channel widening caused by 13 cutoff events, estimate the amount of sediment released into the channel due to the cutoffs, and infer the physical processes driving river response to cutoffs. We are excited about the potential of Landsat imagery to show us how rivers respond to a variety of natural and anthropogenic perturbations across the globe, including deforestation, damming, gold mining, climate changes, and tectonic activity. Did your team develop RivMAP? Yes, we developed the RivMAP toolbox because we needed tools to efficiently map and measure both river planform statistics and morphodynamics over very large spatial domains. RivMAP relies heavily on powerful image processing techniques for rapid analysis of large datasets. We continue to devlop RivMAP as we expand our analysis to even larger domains and more complex channels.